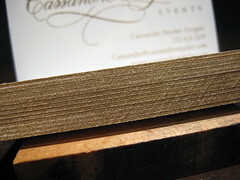 Letterpress, Hot Foil, Edge Coloring, and Thermography, need we say more? These business cards certainly had the kitchen sink of printing/finishing techniques thrown at them but the final result is a luxurious card with flair. 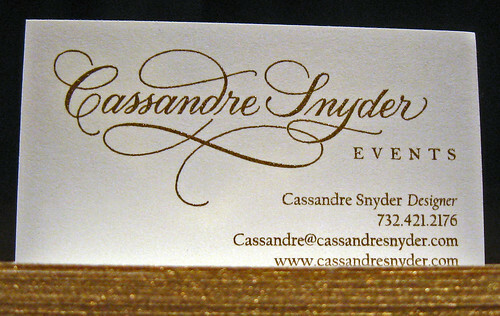 Cassandre Snyder Events is a full service event design and management company located in New Jersey. We worked with Cassandre to create a business card that reflected her style and the type of attention to detail she puts in to events! Cassandra came to use with a great script logo (designed by Deborah Nadel) which we featured prominently on the front of the cards. We actually printed 2 different sets of business cards, all of which are shown above: a letterpress/hot foil card (left / right) and a thermography card (middle). 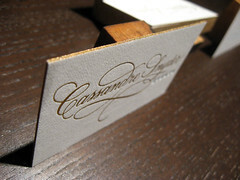 The letterpress cards were printed on 220lb cotton paper (above). The logo on the front was foil stamped using a shiny gold metallic foil, you can almost see your reflection in the calligraphy. The front and back were letterpress printed in a tiffany blue, which helps to add a pop of color to front. 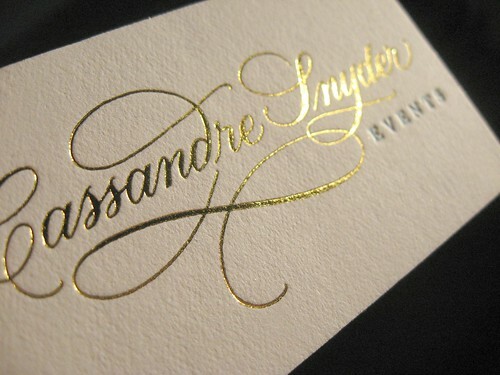 The last touch we added to these cards was the metallic gold edge color that compliments the gold foil. The second set of cards were done using thermography, where a heat-activated powder is added to the printed type. The powder is activated in a heat tunnel and out comes business cards with a raised print. The thermographic powder used was metallic gold. 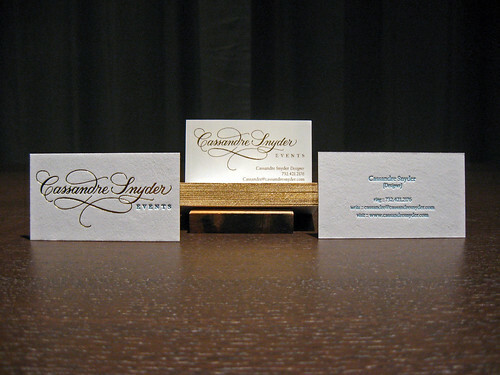 Which part of these cards did you like best (letterpress, edge color, thermography, hot foil)?